Today, I have a slightly different take on brussels sprouts for you guys. Despite my sincere love for a roasted brussels sprout – all dark brown, with nice and crispy edges – there is plenty of delicious flavor to be had in an uncooked brussels sprout. You get the same nutty flavor, but with a little more chew (not unlike regular cabbage), and a lighter, fresher texture and flavor! I think the sturdiness of the shredded sprouts would hold up to all kinds of toppings – maybe some grilled meat, sliced thinly, or some grains (wheatberries or farro, perhaps), toasted nuts, and dried cranberries or cherries. Of course, I’ll be testing out some variations as time goes on! 1.) To start, break your goat cheese into 8 even pieces, and form each one into a flat disk, about 1.5 – 2″ across. Set up a breading station (one bowl with flour, one with the beaten egg, and one with the bread crumbs). Season the flour well, with a generous pinch each of kosher salt and pepper, and then bread your goat cheese (flour first, then egg, then bread crumbs – tapping off excess in between steps). 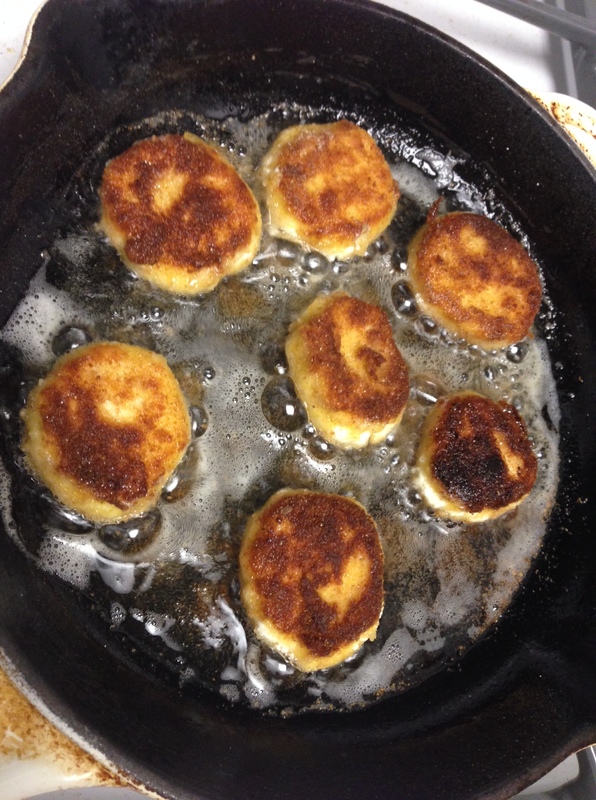 Set the breaded goat cheese rounds on a plate, and put them in the refrigerator for about 20 minutes. 2.) While the goat cheese chills, start shredding your brussels sprouts. Remove any bruised or dirty outer leaves from the sprouts, then cut them in half from root to top. Lay them flat side down, and cut the into very thin pieces, working down to the root. 3.) Whisk together the ingredients for the dressing; taste, and add more honey or vinegar to your preference. Pour the dressing over the shredded brussels sprouts, and toss to coat. 4.) Heat a small skillet over medium heat, and add enough oil to cover the bottom with about 1/8″ of oil. Once the oil is hot, add your chilled goat cheese rounds. Shallow fry for about 2 minutes on the first side, until they’re golden brown. Flip, and cook for another minute or so, until they’re golden brown on the second side. Remove them to a paper towel-lined plate. 5.) 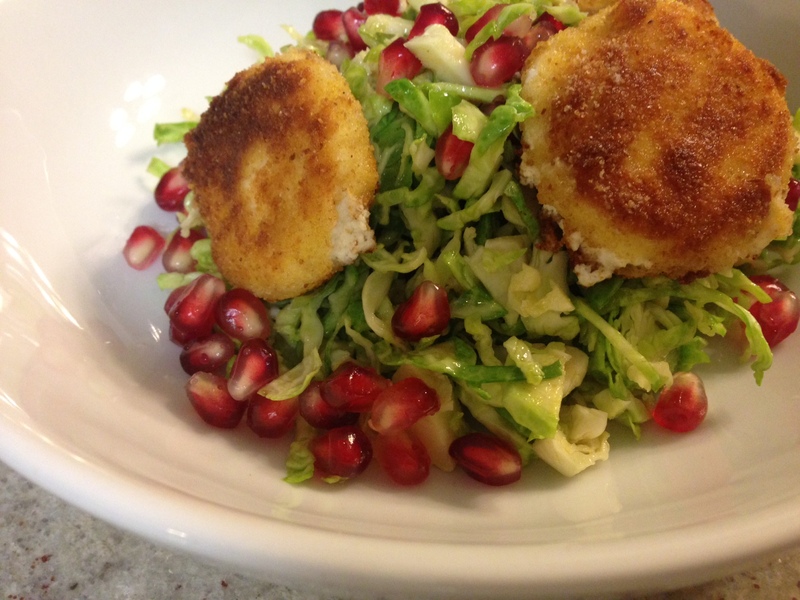 Pile the brussels sprouts into bowls, sprinkle generously with pomegranate arils, and top with the fried goat cheese. 1.) shredding the brussels sprouts was a tiny bit tedious. 2.) the texture of the raw sprouts took a few bites to get used to. But! I got used to the texture of the raw brussels sprouts pretty quickly; they were actually super light and refreshing! The crispy, slightly warm goat cheese worked really well with the cold, tart pomegranate arils – and all the flavors and textures just came together perfectly. 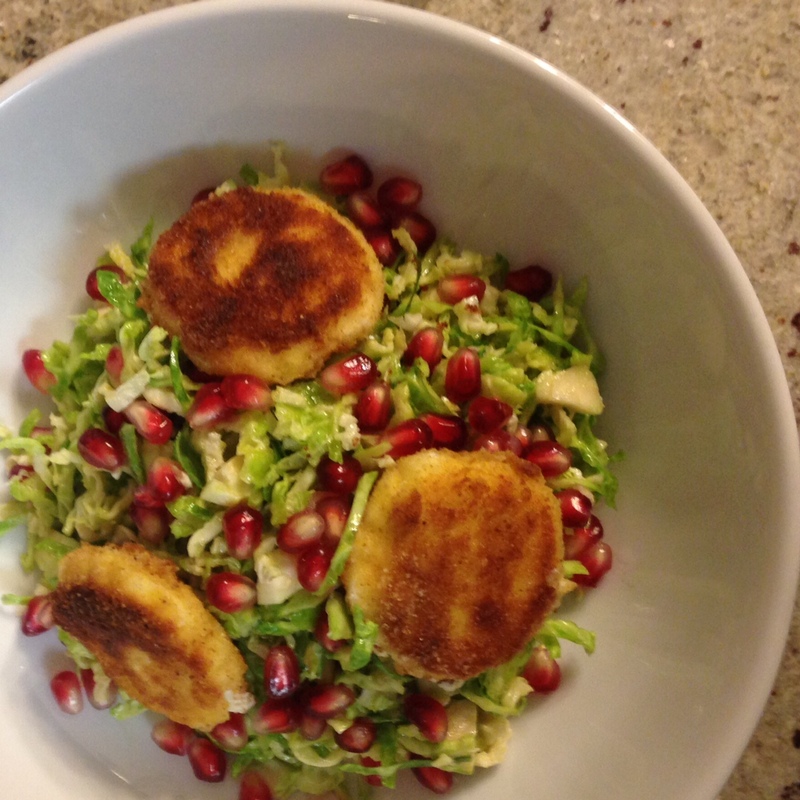 This salad is perfect as a light dinner, and would also be a great side dish for Thanksgiving, to sort of help balance out all the other heavy dishes. If you did choose to make this salad for Thanksgiving, or another dinner event, you can prep almost all of it in advance. The shredded brussels sprouts will be fine for a day or two, stored in a ziploc bag in the refrigerator. The dressing will keep just fine in the fridge for a couple days (just give it a quick whisk before pouring it on to the salad), and you could even bread and chill the goat cheese rounds several hours in advance. If everything is prepped ahead of time, all you’ll need is about 5 minutes at the stove to get the goat cheese fried up, and you’re good to go! Would it be weird to have 5 varieties of brussels sprouts on my table for Thanksgiving?